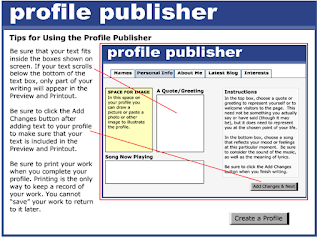 Profile Publisher is an excellent interactive tool from ReadWriteThink we are re-featuring here in EdTech and mLearning for the second time. Students can use it to create mock or fake social media networking profiles. It is similar to other popular tool called Fakebook. 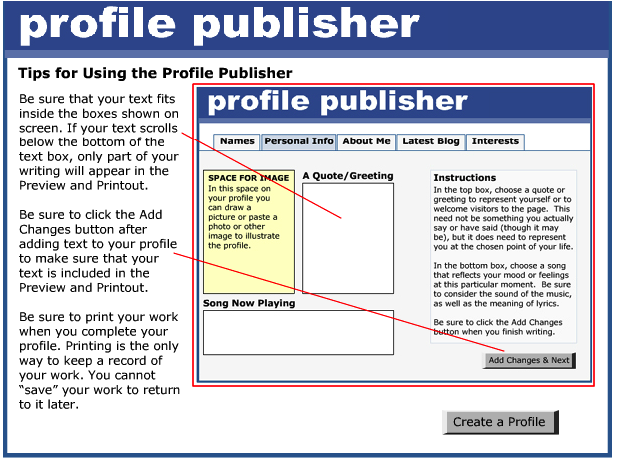 It can also be used to create profiles for fictional characters, yearbook profiles or profiles for historical figures. The educational potential of the tool is that it helps students engage in creative writing tasks and literacy activities that support multimodal texts. It is also a great way to enhances students communicative as well as collaborative work skills. Profile Publisher is web based and does not require any software download. To start using it click on ‘Get started’ and choose which kind of profile you want to create: personal or fictional character’s profile. Once selected, follow the instructions and fill in textual boxes with your data. You can also add multimedia materials such as images to your profile and when you are done click on preview to see how your profile looks like before you print it out. Once done, print your final product and share it with others.